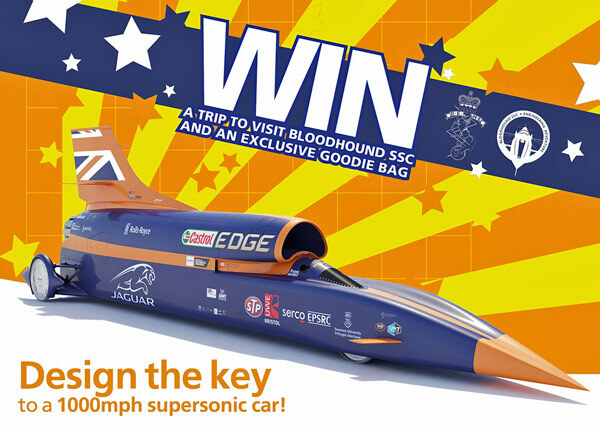 A COMPETITION has been launched inviting children to design the keys for Bloodhound Supersonic Car – the 1,000mph car. Get your children fired up about careers in Science Technology Engineering and Maths (STEM) with this once-in-a-lifetime competition which challenges them with a real-world problem. Bloodhound is aiming to break the land speed record with a car powered by a jet engine and a hybrid rocket motor. The chosen design will be manufactured by the British Army’s REME team and used to power up the car for its record attempts. In the driving seat will be RAF Wing Commander Andy Green, the man who set the current world land speed record back in 1997. The key will be made by Army Reservist Craftsman Liz Brown using her skills as a REME Armourer. Liz said: “The competition is an amazing opportunity for children to get involved with engineering. “It’s a real life problem we are asking children of all ages to solve and the key will be used in the actual car. I wish I had something like this when I was younger! The competition winner will receive a VIP trip to Bloodhound’s technical centre in Bristol to watch their key being made, as well as a supersonic goodie bag. Project Director Richard Noble said: “The REME team helping build Bloodhound are engineering superheroes. They’re fantastic role models who get kids buzzing about STEM.